Following the main autumn presentations the L2L partnership deliver a number of follow up events called Learn2Live Question Time (L2LQT). The academic research carried out into the effectiveness of Learn2Live recommends that the potentially life-saving messages, of the main autumn presentations, are reinforced approximately 3 to 6 months later in order to maximise the opportunity for students to retain the central messages. For this reason we run L2LQT events during the Spring term. These completely free sessions are availble to be delivered at individual schools/colleges to sixth form students who have already attended the Autumn Learn2Live Main presentation. L2LQT sessions are delivered in approximately 60 minutes. These interactive presentations are designed to engage students and encourage them to question their own vulnerability and to look at their own risks of being involved in a road traffic collision. During the session students are challenged to think about impulsive behaviours, how they react to peer pressure, and they are taught examples of coping strategies that will help them to deal with potentially pressured and/or dangerous situations. Students have lots of opportunity to give feedback and ask questions in a more relaxed environment. What do other schools say about this event? How can I get a Learn2Live Question Time event at my school/college? 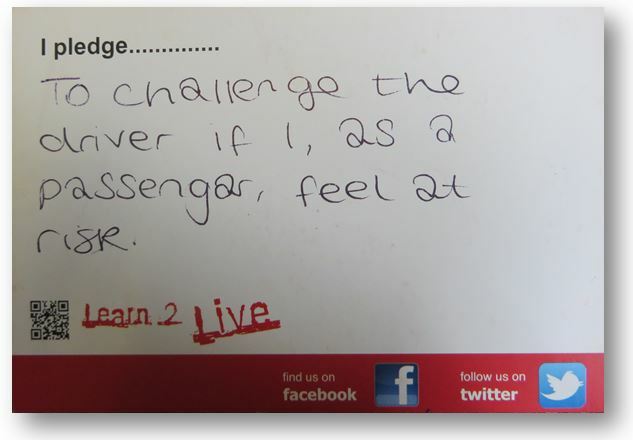 During Learn2Live Question Time sessions students are also encouraged to make a personal Pledge about an aspect of their behaviour that they are going to change to keep themselves and their friends safer on the roads. We also ask students to think about how they would deal with a potentially difficult situation e.g. their friend is speeding whilst they are a passenger. Students develop a coping strategy using the SAFE tool. If you would like to make a pledge yourself then please visit our Learn 2 Live Facebook page. This website gives you lots of information about the positive steps you can take to keep yourself and your friends safer on the road. A further positive step is writing a pledge of something that you are going to do differently from today. Your pledge is personal to you, it can be something you keep to yourself or you can put up on our social media pages or share with your family and friends. Research shows that if you actually write a pledge down you are more likely to keep your pledge for longer and the more you share it this likelihood increases further. Your pledge can also be stored in your newly downloaded PANIC app which will then remind you of what you said you were going to do. The pledge can be as simple as “I will give blood” or more challenging “I will always challenge the driver if they attempt to use their mobile whilst driving.” To make a pledge you have to think of how you will achieve it and what barriers there are to stop you from achieving it. When you make a pledge you need to think through how you will deal with any barriers and any reaction or comments you get from your friends or family. For example “I will give blood”…However, if you are afraid of needles, maybe your pledge will include making sure you always take a friend who knows about your concerns and will support you and make sure you go through with it.